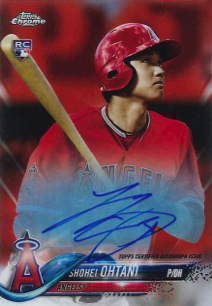 BE THE FIRST PERSON TO PULL A 2018 TOPPS CHROME OHTANI AUTOGRAPH AT SPORTS CARDS PLUS AND WIN $100.00. Boxes and packs must be opened in our store to qualify for the $100 prize. 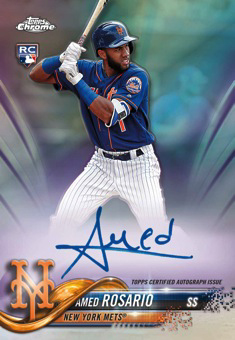 2018 Topps Chrome Baseball continues one of the longest running lines in the hobby. For more than 20 years, it has offered a chromium spin on the flagship line. It’s not just the base set, but in the inserts as well. However, the place where Chrome stands out is the emphasis on autographs, particularly when it comes to rookies. 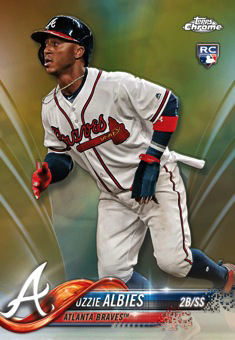 In recent years, 2018 Topps Chrome Baseball has produced both hobby and hobby jumbo versions. Hobby boxes come with a pair of autographs while hobby jumbo boxes have five. The 2018 Topps Chrome Baseball base set is gathering of only the best of Series 1 and Series 2 main set. It’s not nearly as large as the combined 700 cards, but it does have the key veterans and rookies. And with that main set comes one of the year’s biggest baseball rainbow parallels. Regular Refractors and their rainbow backgrounds kick things off. Other Refractors include Prism, Negative, Purple, Blue, Green, Green Wave, Blue Wave, Gold, Gold Wave, Orange (/25), Red (/5), Red Wave (/5) and Superfractors (1/1). Cards also have one-of-one Printing Plates. Each has a black, cyan, magenta and yellow version. 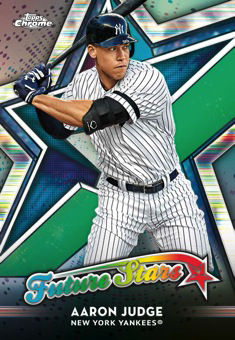 As far as where to find these Refractors, some are exclusives. Three of the Wave Refractors, Green, Blue and Gold, are only in hobby and hobby jumbo boxes. Orange Refractors can only be found in regular hobby boxes, not jumbo. Select base cards also have short print variations with alternate images. 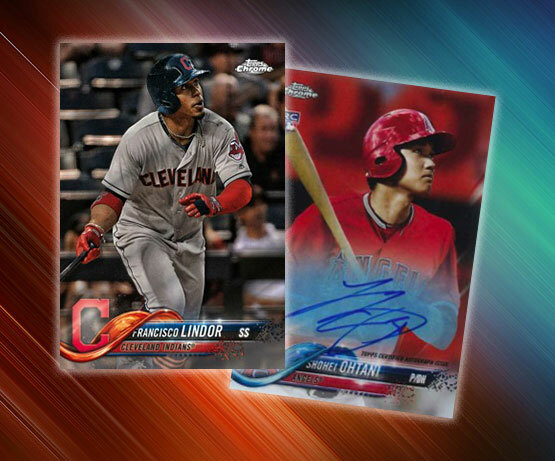 Rookie Autographs dominate the signature landscape in 2018 Topps Chrome Baseball. These come with on-card signatures from a deep list of young talented players, headlined by Shohei Ohtani. Like the base set, Refractors add lots of color. All come numbered. These include basic Refractors, Purple, Blue, Blue Wave, Gold, Gold Wave, Orange (/25), Red (/5), Red Wave (/5), Printing Plates (1/1) and Superfractors (1/1). Gold Wave, Red Wave and Superfractor Rookie Autographs are exclusive to hobby and hobby jumbo boxes. Like base cards, Orange Refractors are only in basic hobby boxes. 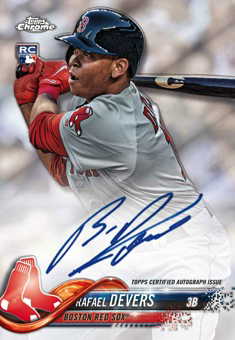 Dual Rookie Autographs are new to 2018 Topps Chrome Baseball. 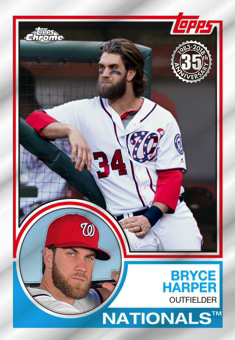 Red Refractors (/5) and Superfractors (1/1) are the only parallels. Several of the main insert sets come with autographed versions as well. 2018 Topps Chrome Baseball has several other inserts. Some are chromed out versions of flagship inserts. Some stand on their own. The retro-themed 1983 Topps Baseball gets a regular Chrome version. While largely the same, these have a basic chromium finish unlike the cards with the patterned backgrounds included in the 2018 Topps Silver Packs. Freshman Flash and Future Stars both highlight the game’s young players. All three of these have numbered Green, Orange (/25), Red (/5) and Superfractor (1/1) parallels. Select cards also have autographs with Orange (/25), Red (/5), Printing Plate (1/1) and Superfractor (1/1) versions. 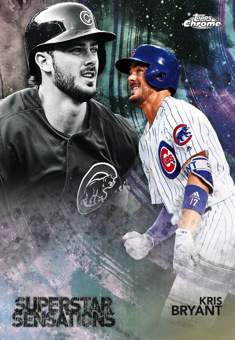 Superstar Sensations and its modern and colorful design makes the leap from 2018 Topps Baseball. Parallels include Orange (/25), Red (/5) and Superfractors (1/1). Autographs are also randomly inserted. 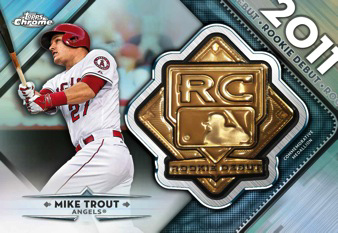 Rookie Debut inserts add a manufactured relic element to 2018 Topps Chrome Baseball. Falling one per hobby case, these have a medallion of the RC logo embedded in them. Besides the regular versions are Green Refractors, Orange Refractors (/25), Red Refractors (/5) and Superfractors (1/1). Some also have numbered autographs. Rookie Debut cards are not available in retail packs.